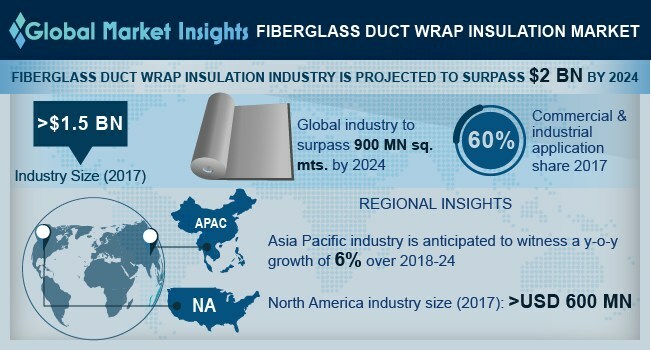 Fiberglass Duct Wrap Insulation Market size is estimated to exceed USD 2 billion by 2024; according to a new research report by Global Market Insights, Inc.
Strong outlook in external insulation of residential and commercial heating, dual temperature and air conditioning components will propel the fiberglass duct wrap insulation market size. Enhanced thermal resistance leading to lower energy usage and improved system performance are among the key properties driving the product penetration. In addition, improved comfort control, easy installation, flexibility and condensation controlling features will offer a positive outlook for industry growth. Stringent government regulations on essential and optimum fabrication on residential and commercial HVAC components to improve energy efficiency will propel the fiberglass duct wrap insulation market demand. Moreover, several standards enacted for the product installation by government and institutional bodies will support the product penetration. Rising demand for insulating products along with technological advancements and product innovations will fuel the industry growth. Growth in global construction industry due to rapid urbanization and changing lifestyles will propel the product demand. Increasing product adoption in commercial as well as residential applications is expected to propel the fiberglass duct wrap insulation market growth. Improved noise control & indoor air quality, high energy efficiency along with competitive costs than non-fibrous glass solutions are among key properties stimulating the industry growth. Shifting preference for duct-based HVAC equipment including unitary air conditioning particularly for the commercial buildings will support the industry demand. Rising awareness for energy conservation and sustainable solutions among builders and contractors has stimulated the product scope. Increasing raw material costs will have a direct impact on the fiberglass duct wrap insulation price trend. However, limited applicability may hamper the product scope particularly in components conveying solids or corrosive gases and kitchen & exhaust applications. Faced fiberglass duct wrap insulation market catered for over 65% of the industry share in 2017. Rising product demand for acoustic and thermal control in air conditioning and air handling equipment, will propel the product demand. Significant properties including noncombustible, enhanced durability along with high noise attenuation has enhanced the product scope. Residential application is the fastest growing segment in the fiberglass duct wrap insulation market registering over 350 million square meters by 2024. Government initiatives and supportive policies on development of residential construction will drive the industry growth. Innovations in production process and increasing R&D investments are among major factors supporting the industry demand. Asia Pacific is anticipated to witness growth over 6% from 2018 to 2024. Growing population along with rising awareness for energy conservation and reducing energy cost are among key properties driving the industry demand. Growth in commercial and residential building constructions especially in China and India will support industry demand. North America fiberglass duct wrap insulation market dominated the revenue share valuing over USD 600 million in 2017. Growing number of commercial buildings in the country including shopping malls, hotels, retail outlets, restaurants and warehouses are enhancing the product demand. Increased preference for glass wool over other materials provides a positive outlook for the product demand. Owens Corning, Johns Manville, CertainTeed and Knauf are among major fiberglass duct wrap insulation manufacturers. Global industry share is highly competitive due to presence of both multinational companies and regional players. New product launches, mergers and acquisitions, production capacity expansion, R&D investments and collaborations are among major strategies adopted by fiberglass duct wrap insulation market participants. Other considerable companies include Manson, Twiga, Mag-Isover, Frost King and Lamtec Corporation.